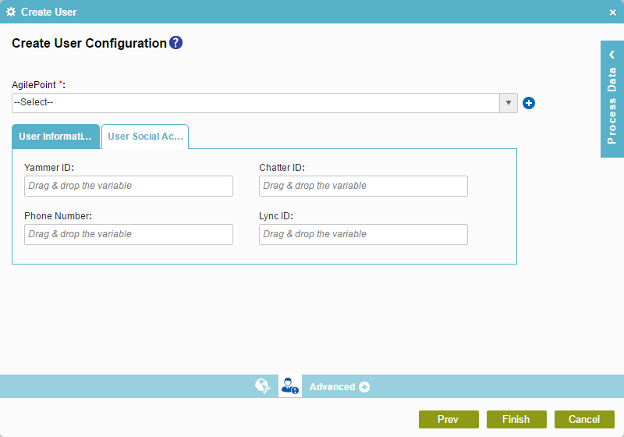 To create a user in AgilePoint NX, do the procedure in this topic. AgilePoint NX OnPremises or AgilePoint NX PrivateCloud environment. Access Tokens for AgilePoint NX. In most text fields, you can use process data variables as an alternative to literal data values. This activity does the same action as Add a New User in Manage Center. You can configure whether this activity waits for other activities before it runs. For more information, refer to How Do I Configure an Activity to Wait for Other Incoming Activities? In the Process Builder, in the Activity Library, open the AgilePoint NX tab. On the AgilePoint NX tab, drag the Create User activity onto your process. In your process, double-click your activity. On the Create User Configuration screen, in the AgilePoint field, select your AgilePoint NX access token. To create a new access token, click Add Token . For more information, refer to Access Token for AgilePoint NX. To enter the user's basic information, do this procedure. Click the Create User Configuration > User Information tab and complete these fields as necessary. Specifies the name of the user to create in AgilePoint NX. Specifies the full name of the user. One line of text that can have spaces. (Optional) To add more user information, complete these fields as necessary. The user name of the manager. A valid language from the list. A text string in e-mail address format. (Optional) To enter the user's social account information, do this procedure. 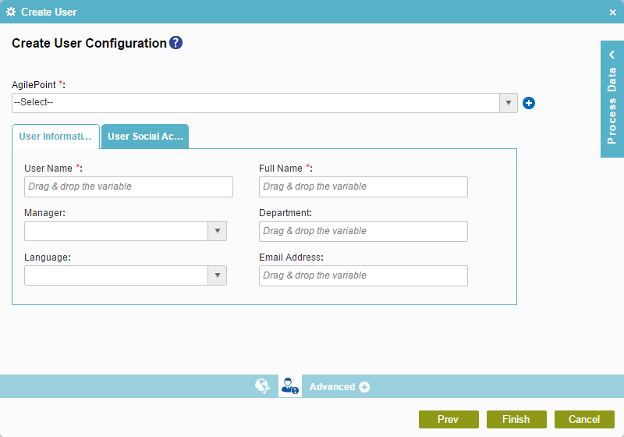 Click the Create User Configuration > User Social Accounts tab and complete these fields as necessary. Specifies the user's Yammer ID. Specifies the user's Chatter ID. Specifies the user's phone number. Specifies the Lync ID of the user.